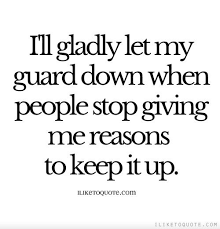 We all end up putting our guards up after experiencing living our life without it. Life when it becomes hard…you come crashing, whether it’s getting your heart-broken, being humiliated, being stabbed at the back, in case your trust is broken. All these incidents are eye openers, whereas some people say, you become wiser. In other words, it ends up making you hard and less trusting and one stops operating from the place called “love”. Putting our guards up is the outcome of such experiences. It’s the only way to defend ourselves from the harsh world that we live in.